In fact, I had to look up where Mt. Washington was. At best guess, I think Save the World Sister went to New Hampshire and went up Mt. Washington Auto Road and brought this back for me? I picked this, because as I stare 2010 right in the face, all I can think of is just making it past the first quarter of the year, and how there's a long and very winding road before the end of March. It's odd that I haven't magnetblogged about New Hampshire before. I mean, I've done the state for myself, but not for this mountain. Of course, when I went, it was with an old friend of mine, and we were headed up there to hang out with her relatives for the weekend. 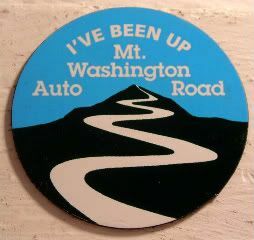 It was so long ago, I don't even remember why we went up there. It was the oddest trip, really. The house we stayed in was filled to the brim with collectibles. Everywhere we turned, upstairs, downstairs, in the attic, in the basement, in the bedrooms, in the kitchens, there was something else the owners collected. Any one item that had more than one of itself made, there were literally dozens of them in the house. Yeah, read that sentence again. But, I'm serious. Ya'll know how I watch Cash in the Attic, like all the time? This house should have been a prime candidate - I've never seen anything before or since like that house. Now? I would love a second chance to do a good old-fashion rummage about the house - turn over every little piece, explore every nook and cranny, in every stuffed to the gills room. Well, except for the ammunition collection - that I didn't want to explore, no matter how historical the collection was. Not. Even. Kidding. I guess New Hampshire isn't kidding when they say Live Free or Die.